A good variety of Anemone for naturalising with its deep green foliage and strong yellow flowers. 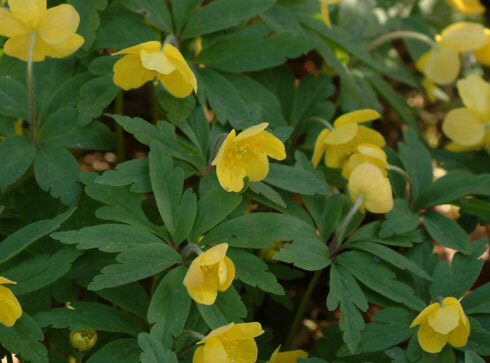 A much admired woodland perennial for partial shade or shady moist soils. Foliage on this species is dissected into finger-like growths, only one leaf per petiole. The stem resides below the soil surface and is bark brown in colour. Multiplication is by division of these rhizomes. Flowers are daisy-like and around 2 cms wide or so. Each is composed of a boss of yellow stamens and ray florets of a strong yellow colour. These can often last for two to three weeks if the weather conditions are cool. Overall flowering period is around eight weeks long.